Edgematching puzzles are a genre that I haven’t previously explored very deeply. A classic example is the MacMahon squares puzzle. If you subdivide a square diagonally into four triangles, there are 24 ways to color the triangles using three colors. 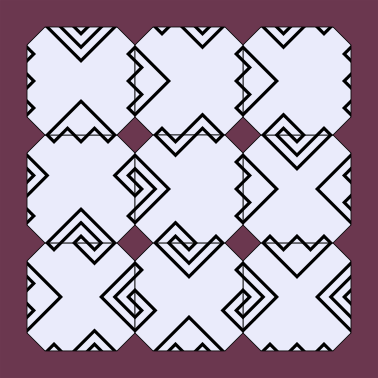 Using a set of 24 squares with all of the possible colorings, it is possible to make a 6×4 rectangle where all of the edges match. As I was pondering the possibility of designing my own edgematching puzzle, I considered that pieces with multiple colors are a bit of a pain to make with a laser cutter. However, engraving lines is relatively easy. And I found a promising set of line patterns related to the Catalan numbers. The Catalan number sequence (1, 2, 5, 14, 42, 132…) is one that comes up in a surprising variety of contexts. For example, Catalan(n) is the number of distinct ways that n pairs of matched parentheses can occur in a string. For n = 3, we have ()()(), (()()), ((())), ()(()), and (())(). 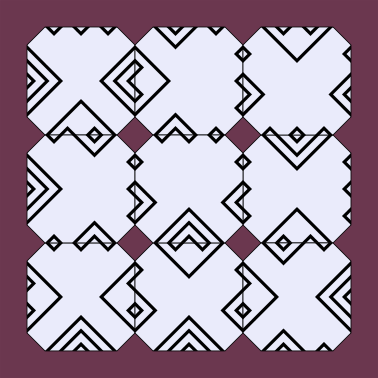 From the perspective of puzzle design, it’s convenient that the proportion of pattern matches of each type is different; this seems likely to result in puzzles that are correspondingly different in difficulty, which is desirable. 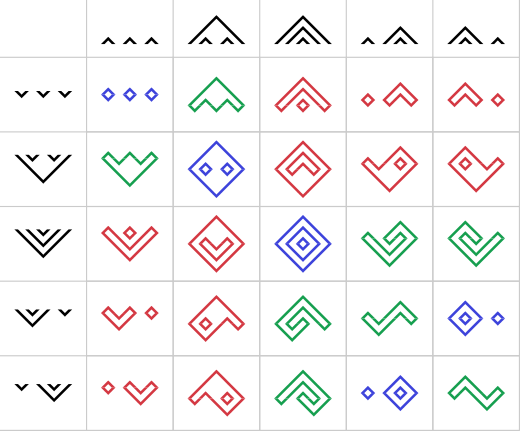 The table also reveals symmetries in how the edge figures form the different types of patterns. If you swap both the rows and the columns of the mirror pair of figures, you get a table with the same loop numbers in the same places, as we would expect. Perhaps more surprisingly, this also works with the first and second rows and columns. Thus those two edge figures form a sort of hidden symmetric pair. If you swap all instances of one in a puzzle solution with instances of the other, you will get a second solution. I’ve already had prototypes made of this puzzle, and it feels promising. I hope to have at least one more post about variations on this design, but for now I’ll stop here. Now I find myself wondering if there’s an interesting enumeration in the classification of the C_n^2 possible combinations into the n “loopiness classes”. Clearly there are exactly n in the class with n loops (since every upper half matches uniquely with its lower half to form an n-loop combination), but the other classes seem a bit opaque (although the one-loop class looks to be interesting). This is all irrelevant to your actual project here, mind.But it did jump out at me as a potentially interesting enumerative problem. A followup to my previous comment: the one-loop case is, unsurprisingly, a known sequence, OEIS A005315.